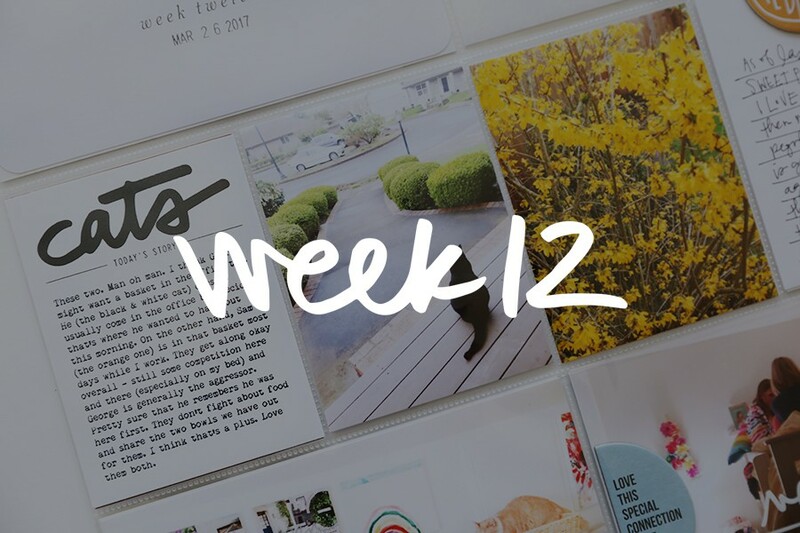 Welcome to Project Life 2012 | Week Thirteen. Hello vacation week. Specifically hello Disneyland week. To tackle our vacation within Project Life I decided to just pick seven photos for the week. There's a ton of different ways I could have approached this (including adding in a bunch of inserts to include more photos and words). I actually liked the challenge of choosing just seven photos. I went with one from each day - one that I love for one reason or another. I'm definitely going to do some other sort of album/photobook to document the complete trip - not sure on that format yet - I'll most likely tackle that after Week In The Life. I'm also participating in a big Project Life giveaway today - more details are available at the bottom of my post. Please note that because these items ship directly from Amazon.com that this giveaway is open only to US residents. For the journaling I used my For The Love Of Days Journal Cards die cut with the Silhouette. I decided to just hit the basic highlights with my journaling here - I'll go more in-depth in the main album/photobook I create. The "love" frame is from 4x6 Sentiment. The "This Is Awesome" is from This One. Can't seem to get enough of those glitter letter stickers from American Crafts. For The Love Of Days Journal Cards. Edges rounded with the Corner Chomper. 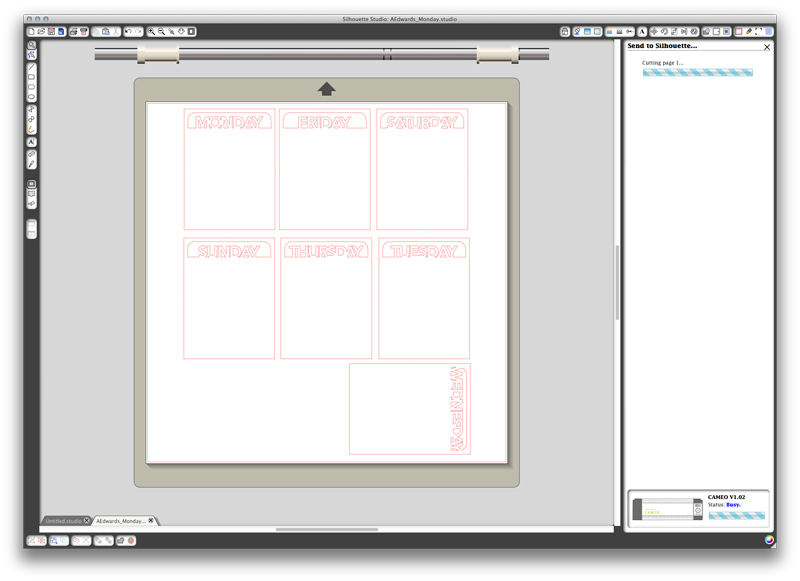 Here's a look at the For The Love of Days Journal Cards after they have been traced using the Silhouette software. You can watch a simple video about tracing PNG files with Silhouette Studio here. Since there are eight 3x4 slots I decided to include on additional photo. The "Great Adventures" sticker is from the Miss Caroline line from My Minds Eye. Still loving those Happy Days Wood Banners. 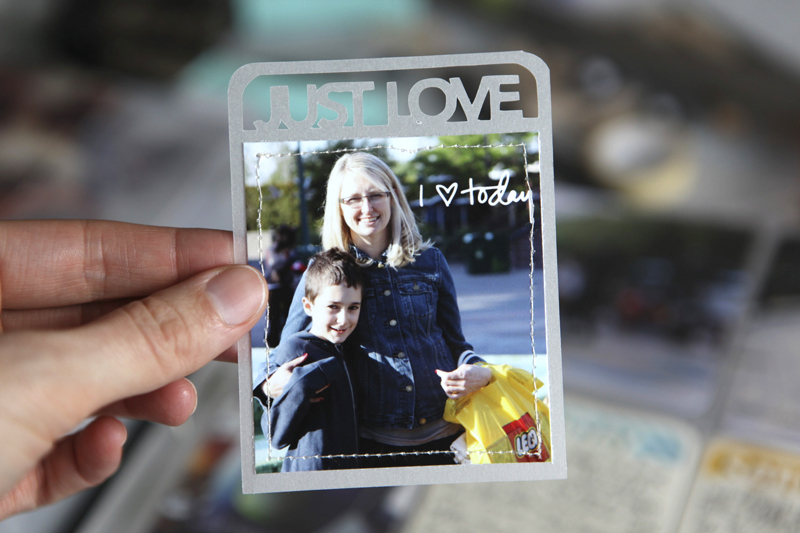 I used the For The Love Of Life Journal Cards and cut it on the Silhouette using vellum. The "I heart today" is from my I Heart Stories set. Photo was stitched onto the vellum using my sewing machine. I'm feeling totally satisfied with this treatment of our trip in this album. 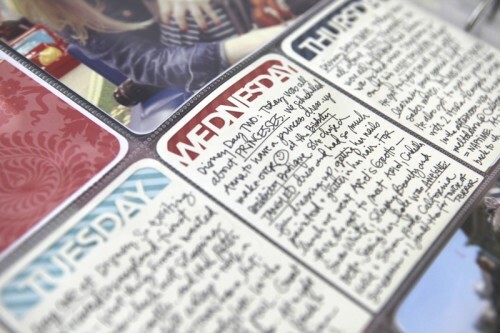 Really like how the journal cards came out and I like the simplicity of the week. I'm sure I would of liked it if I added in more photos too, but I like that this hits the highlights. 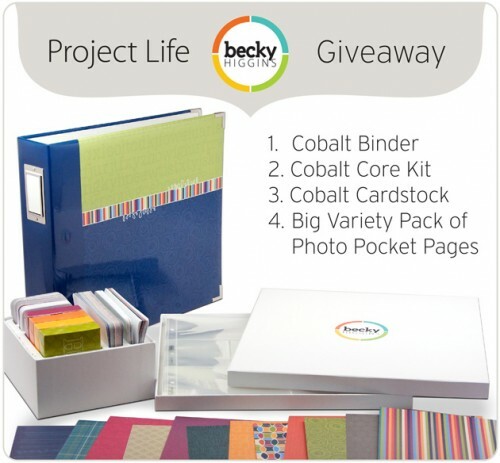 GIVEAWAY | One person will receive a Cobalt Binder, Cobalt Core Kit, Cobalt Cardstock, and Big Variety Pack of Photo Pocket Pages from Becky Higgins LLC. Please note that because these items ship directly from Amazon.com that this giveaway is for US residents only. TO BE ENTERED into this giveaway please leave a comment below (if you are reading this post on Facebook please come to my blog to leave a comment). Comments will be closed at 9am Pacific on Friday, April 13. The winner will be posted shortly after. Please be sure to check back or subscribe (click here to get posts delivered to your email box) to see if you are receiving one of the items this week. 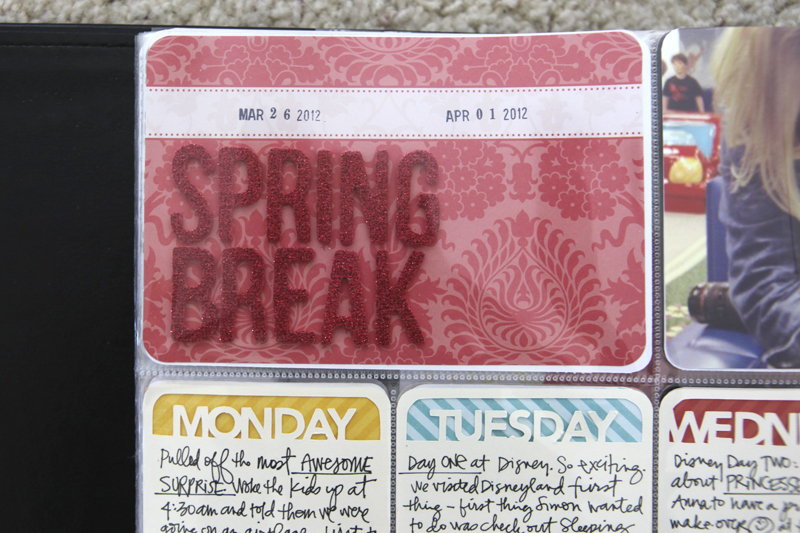 Love the approach you took for the Disney part of your project life pages. And thanks for the chance to win! Those journaling cards are awesome. Really wishing I had a Silouette right now. Glad you guys had such an amazing time. Thanks for the chance to win. I already have these products, but I have a friend who would absolutely love them. Fingers crossed. I am finding it hard not to want to print every picture I take during the week! And a vacation week certainly makes that harder. 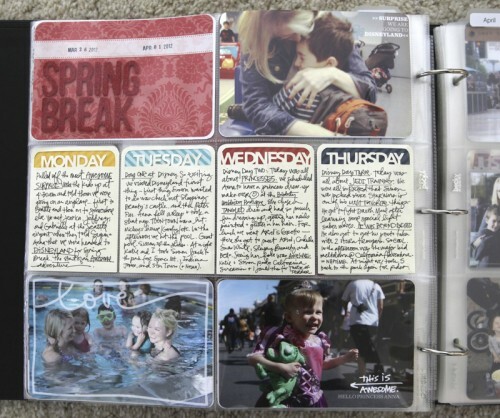 I like how you printed a picture for each day - great idea! And I can't wait to see what you do with the rest of your Disney pics! I hope you have a great week! Just starting Project Life and haven't purchased a Core Kit yet. Fingers crossed! looks like your family had a wonderful time at Disney! 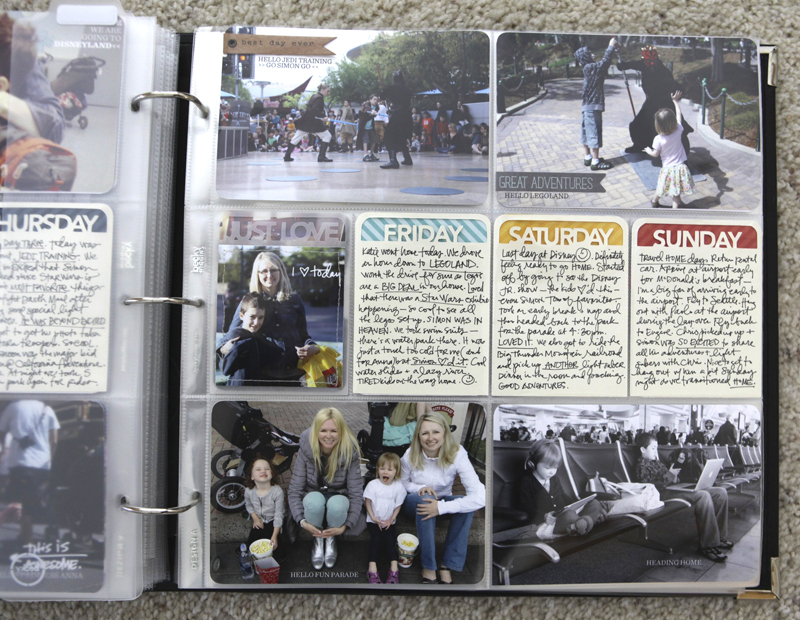 i love that you limited your project life coverage to one photo a day - that had to be challenging! thanks for always posting so much inspiration!! I love your new journaling cards! Can't wait to try them out on my Cameo. And thanks for the chance to win! I like how it is such a nice, clean layout, and it looks great side-by-side. Your trip decisions will help me with future weeks with similar big events. A good reminder that sometimes less is more! What a great giveaway as well! Love your pictures! I also love project life and the Cobalt kit would be a nice addition to my PL stash. Thanks for the chance to win! 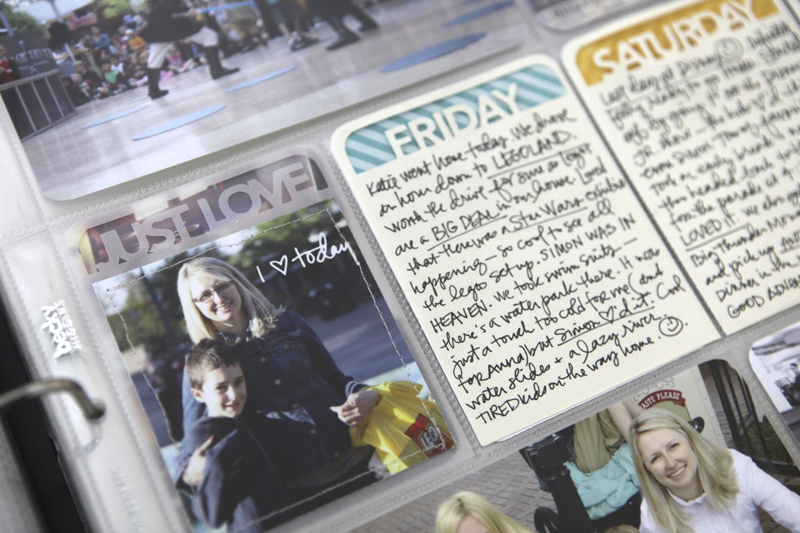 I love what you did wih the journaling cards. I would love to win this kit! thanks for the chance to win! Those cards are fabulous! Thanks for the chance at the core kit I've frequently considered getting! I've been wanting to order this so badly! Thanks for the chance to win this core kit. 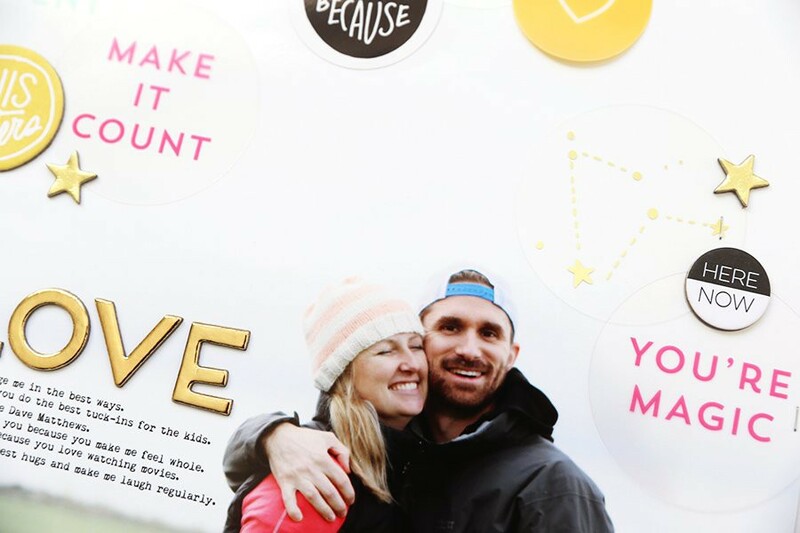 I'm definitely wanting to jump into project life with you! Your Project Life pages are always so beautiful. I'd love to give this a try! how about a Canadian with a US address? 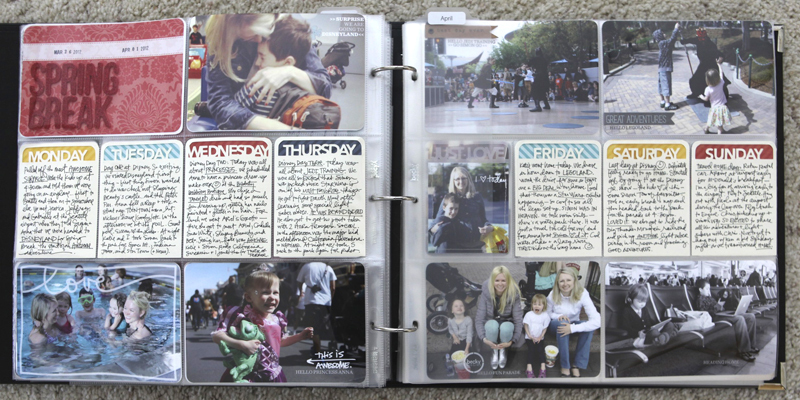 ( winkwink...) love what you do with your Project Life Ali, thanks for sharing! I am going to enter this on behalf of a friend --- would love to win it. Just also have to say that your work with the Silhouette is like magic. Love the posts where you've used it for the PL! i love the way this turned out! i think it's hard to decide how to handle a different week and this is fabulous. I am in NZ but want to enter a friend who lives in the States. She has six kids and hasn't done much scrapbooking lately. Thanks for the chance. What a fabulous spring break memory with your kids! Thanks for the opportunity for the Project Life giveaway! We just got back from Disney too...I chose a quick slide in album so we can enjoy the photos, but want to do some other pages or a smaller album so I can tell some longer stories. Your new pl layout is so fun ...love the cut outs. Would love to be entered in the giveaway ...thank you! Whoa, nice start to my Monday! 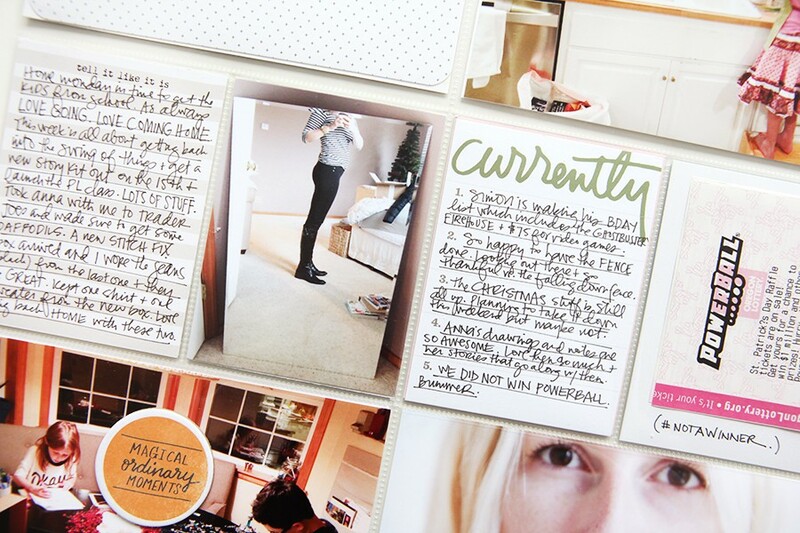 The journaling cards really make me want to run out and buy a Silhouette!!! And I have been wanting to do Project Life, so a chance to get started is a special chance! Have a great week. Love Disneyland! Would love to win this for my sister to get her started on Project Life. Thanks for the chance! Disney is just awesome! Using the silhouette on For The Love of Days cards is beautiful - what a nice touch. Thanks for the chance to win a Project Life! Neat use of the Silhouette! So wish we could do Disney:) Just starting PL but using my current stash for now, lol. Absolutely love this spread. Maybe it's the simplicity of it. 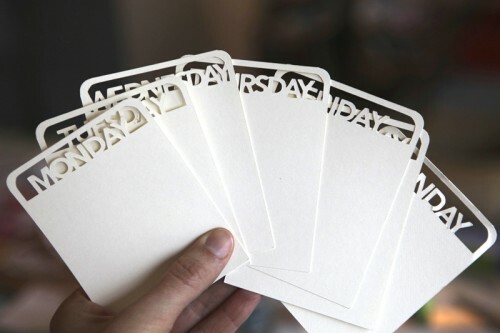 I adore your love of days journal cards and they make me want a silhouette. i guess i could just overlay them over a piece of paper (digitally) for the same effect - yes? thanks so much for the project life giveaway - i've been considering joining in for the fun beginning june 1 - would be a great beginning.